Not just because I’m a mother and I often get gifts and taken out to dinner or lunch. I often have all my children together too, which is one of my favorite things. I love to celebrate all women who devote their lives or a part of their lives to care for children. When we see caring for children as the privilege of raising the next generation of Godly men and women it truly becomes a calling and not just something we have to do. In addition to mothers, I’d like to encourage you to see women who aren’t mothers in the main sense of the word. But they serve as Sunday school teachers, nursery workers, Vacation Bible School leaders and dozens of other ways. They often take advantage of teachable moments when a parent isn’t around to instill some small truth into a child’s life. Therefore they are planting seeds for someone to water and for the Lord to use them to grow them into the man or woman he wants them to be. In our church, several families welcome other families little one to sit with them during the service. Giving the parents a short break and getting to enjoy some time with a younger child. We had this happen last week and it was a joy. I tend to forget the simple pleasure younger children take in all aspects of life. Even a simple thank you can encourage them to keep on adding to the training your children are receiving. 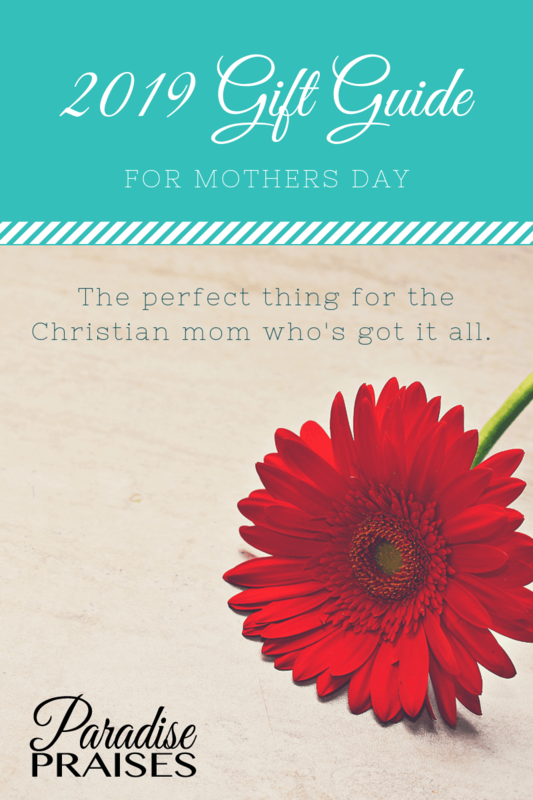 Below you will find a variety of gifts a mother or sister-in-the-Lord might enjoy. There are some you might even enjoy yourselves. Feel free to put them on your Mother’s Day list. As the stay-at-home mother of two daughters who have been home educated from the beginning of their school years, Phyllis has gained a lot of practical experience, which she shares throughout this book. 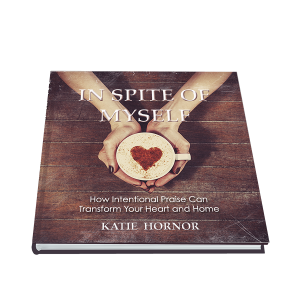 In an effort to encourage others she has written extensively about the ways she and her husband worked to discipline and train their daughters to be women who love the Lord with all their hearts, souls, and minds. 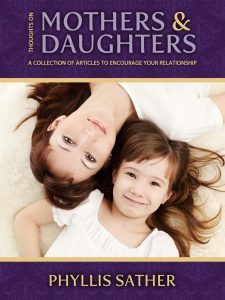 It is her hope that you will find helpful words of encouragement on everyday life as she visits with you and shares stories and ideas about parenting daughters. Get a copy to gift a mother/friend/sister in your life here. 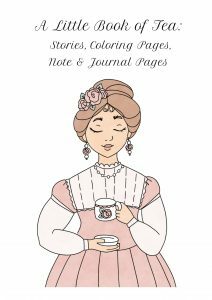 Take some time for yourself with this little ebook about tea! Enjoy the old fashioned tea stories and anecdotes, while sipping your own cup of tea! The coloring pages can be printed out for you to color, or to give to your children or grandchildren to color. Print as many notes and journal pages as you like, in color or black and white, and use them to write your thoughts down, notes, to do lists or even recipes. Get your copy of A Little Book of Tea, here. 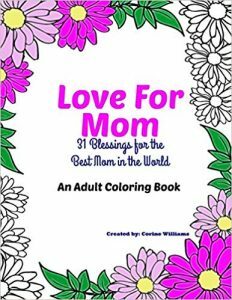 Give your mother the gift of relaxation with this inspiring anti-stress adult coloring book. Beyond helping your mother relax, this beautiful book will also let her know how much you love and appreciate her. There are a variety of images in this book that is sure to keep you engaged. Purchase Love for Mom, here. Homeschooling is on the rise. You may be considering it or even in the decision process, but you wonder if it is right for you. Do you have what it takes? What does homeschooling look like in a real family? 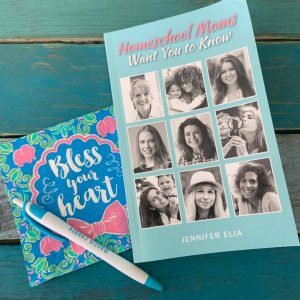 If you want answers, inspiration, and a first-hand glimpse into real homeschools run by real moms, Homeschool Moms Want You to Know is written just for you. You don’t need another ultra perfect, super polished goal to strive for. Let’s be honest, no one is perfect! This book is a bridge, not a wall. It takes you into the real lives, experiences, and challenges of moms just like you, who happen to homeschool their children. Homeschooling is so much more than just getting the lessons done. You are qualified to teach your child. It is hard work, but we promise you, if we can do it, you can, too! We are not supermoms, we are simply moms doing our best for our children in the best ways we know how. Isn’t that what every mom wants. Make an informed decision, dispel some myths, and see what homeschooling really is. You’ll laugh, you’ll cry, you’ll walk away from a more empowered, inspired, and confident mother, no matter what educational model you choose for your children. Written by real homeschool moms, for real moms just like you. Come take a tour of our lives, our mistakes, and our victories. There’s no whitewashing here. If you want an honest look at what homeschooling can do to and for your family, look no further than Homeschool Moms Want You to Know. Get it here. 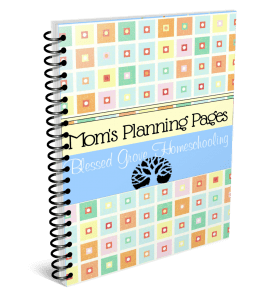 These pages are great for any homeschool mom to have during her planning sessions. Makes an excellent addition to your planning binder. 25 pages total. Pages are excellent for note/lap booking and scrapbooking. Get your digital download planner pages here. They say there are three things of utmost importance to human beings: health, love, and money. And that the lack of one of those things is enough to throw your life into a storm. They also say that most marriages face only one major crisis, but if it comes early in your marriage, you may have another. While these sayings may or may not be true, Katie Hornor has had at least one crisis in each of those three areas. And as she’s learned to praise the Lord for his goodness both in and out of the storms, she begins to see a pattern. Praise brought healing where there would have been anger and bitterness. Healing allowed her to share her story with others, giving them hope for God’s healing in their lives as well. Praise, Healing, and Hope. Regardless of your story, There is only one who can heal your heart, teach it to praise and transform your heart and home. You will find him, and the power of his Truth presented in every page of this riveting 4-week Bible study. Get your copy here and go through the book with the free daily videos provided on the author’s website.